KATMANDU, Nepal — A Hindu festival in which hundreds of thousands of animals are expected to be sacrificed will go ahead as scheduled in southern Nepal despite protests, organizers said Friday. The Gadhimai festival, celebrated every five years, is attended by many Hindus from India as well as Nepal. More than 200,000 buffaloes, pigs, goats, chickens and pigeons are expected to be slaughtered this year on Nov. 24 and 25. 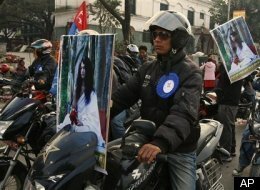 Organizers said they will not bow to "interference" from animal rights and religious groups that have held protests in Katmandu and in the festival area in Bara district, about 100 miles (160 kilometers) south of the capital. "We will not stop this centuries-old tradition now. This is our religion, belief and tradition and we will continue with it no matter what," said Motilal Kushwa of the organizing committee. Kushwa said thousands of people have already arrived at the site with animals meant for sacrifice next week. Participants believe that animal sacrifices for the Hindu goddess Gadhimai will end evil and bring prosperity. Many join the festival from the state of Bihar in India, where animal sacrifices have been banned in some areas. Critics say the killings are barbaric and conducted in a cruel manner. Government administrator Taranath Gauram said hundreds of extra policemen have been sent to the area to maintain security and officials do not expect trouble during the festival. 0 Responses to "Gadhimai Festival: Nepal Mass Animal Sacrifice Festival To Go Ahead Despite Protests"